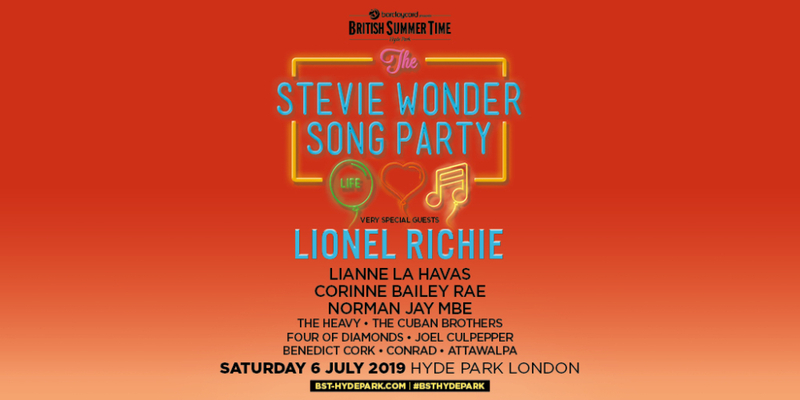 Barclaycard presents British Summer Time, their final headline with the amazing Stevie Wonder with very special guest on the bill, Lionel Richie! This will be a must see show this summer in the wonderful,setting of London's Hyde park! In addition to what will be a very special day in London's Hyde Park, you can choose from a range of Official Ticket Experiences including the Exclusive ** ULTIMATE BAR EXPERIENCE ** with the option of a Barclaycard VIP Summer Garden Ticket, with access to GOLD CIRCLE STANDING AREA or choice of a DIAMOND CIRCLE Ticket, to be right in front of the Great Oak stage! - Arrive to a Welcome Glass of Fizz, Complimentary Bar, Comfortable Occasional Seating, (The Ultimate Bar is an Exclusive Area restricted to The Ultimate Bar Pass Holders Only) The Ultimate Bar opens @ 12:00PM (TBC) - Public Doors 1:00PM but of course you can arrive at your leisure! Provisional Times - Gates Open: 13:00H – please note the gates will be open approx. 60 minutes early for those customers who select Primary Entry, Gold Circle, Barclaycard VIP Summer Garden, Diamond Circle, The Terrace and *The Ultimate Bar * Opens @ 12:00H or arrive at your leisure - Age restrictions - Anyone under 16 must be accompanied by a parent or guardian (18 or over) - Disabled Access - All tickets are available via the festival website or AXS.com. There is a Wheelchair platform and an Ambulant area. All tickets come with 1 free personal assistant. We regret that special access tickets are only bookable via the BST website.